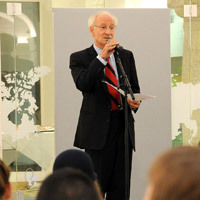 Marin welcomes attendees to Vienna's Open Information Evening. New Webster Vienna director Bernd Marin was on hand with students, faculty, staff and alumni to welcome new prospective students at the Vienna campus' most recent Open Information Evening. This month Marin began his work as director at the campus, where students from over 70 countries are educated for the global labor market and where people from 30 nations are employed in research, teaching and administration. Thanks to all the presenters who helped make the evening a success. See more snapshots from the event in this album on Webster Vienna's Facebook page. For questions or to book a meeting with the Webster Vienna admissions team, contact: admissions@webster.ac.at.